Despite the fact that in the 1990s, in Russia, the number of school and student choirs decreased, levels of many other groups continued to grow. Evidence of this are the reviews written by Russian and foreign experts and the results of the European international choral festivals themselves, in which children and youth choirs from Russia began to take an active part. Today programs for children’s choir performance development are implemented by schools of further education. Many of them had inherited and then spent years and years rebuilding the wonderful traditions of their predecessors, such as the choir studios, which had spent time under the care of the Russian choir society. Throughout that time they continued with the studios’ principles of education, using different types of out-of-school activities, helping students to form friendships and enhance their social skills through summer choir camps and during tours, and increasing the number of concerts and educational activities carried out by children. Today this is particularly relevant given that, in Russia, social and political leaders seem to be praising the advantages that vocal choir traditions have for the ethical and social values of Russian culture and are ready to support mass choir education. Let us, for example, look at one of the events of Russia’s social calendar. In the autumn of 2012 through the initiative of the Mariinsky Theatre’s art director, conductor Valery Gergiev and Russia’s Deputy Prime Minister Olga Golodets, the decision to revive Russia’s choir societies was taken. One of the main tasks of the social organization was to make singing lessons obligatory in all public schools throughout the Russian Federation The next step was for the Ministry of Culture to develop music education programs for kindergartens and schools; this was discussed on June 17th of this year at a hearing of the Public Chamber of the Russian Federation. A number of social and public institutions in Russia fully support the plans to revive Russia’s choral societies, including the Russian Orthodox church, the Public Chamber of Russia, the Union of Soviet Composers, among others. Fortunately, work to revive public choir education does not need to be started from scratch. Wonderful methods, excellent choirs and pedagogues have been preserved. All these help to ensure the success of many cultural and educational initiatives working with children, which were started by Russian choirmasters, as late as the second half of the twentieth century. Since the beginning of 1990, through an initiative of the Moscow Department of Education, performances by children’s choirs have taken place at the festival Young Talents of Moscow. Annually, more than 6000 schoolchildren from Moscow participate in the performances. 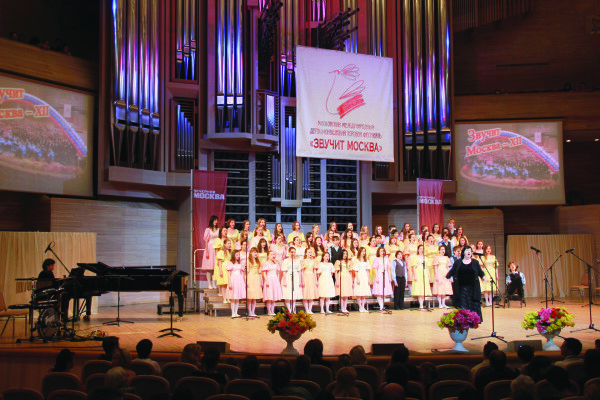 The Radost Children’s Choir School (now the Center of Creative Development and Musical-Aesthetic Education for Children and Young People), which was founded in 1980 and since then has upheld the practice of mass vocal-choir education, became the supervisor and coordinator of mass vocal choir work in Moscow. Through the initiative of Radost Moscow’s Department of Education founded a number of children’s choir initiatives. In 1990 Moscow International Children’s and Youth Choir Festival ‘Moscow Sounds’ was begun. 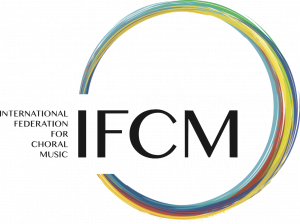 The festival up to now has been Russia’s biggest international and non-commercial youth choir forum. Every two years, in spring, more than 10 thousand lovers of choir music from different countries and cities of the world gather at the festival. Among its participants are choirs from Austria, Armenia, Belorussia, Bulgaria, Germany, Hong Kong, Georgia, Italy, China, Latvia, Lithuania, Moldova, Poland, the USA, Thailand, Ukraine, France, Estonia, Japan and other countries. For choirs arriving at the festival the organization committee arranges exclusive excursion programs, to help them get acquainted with the history, culture and art of Russia’s capital, as well as its monuments, architecture, points of interest and suburbs, which all lend the festival a special status in the field of intercultural communication. Information about the Moscow Sounds festival can be found on the websites www.radost-moscow.ru and www.choirsofmoscow.ru. Since January 2000, for school choirs in Moscow, a children’s and youth choir festival-competition for the best performance of the spiritual ‘Christmas Song’ has been held (as part of the International Festival of Orthodox Music in Russia). 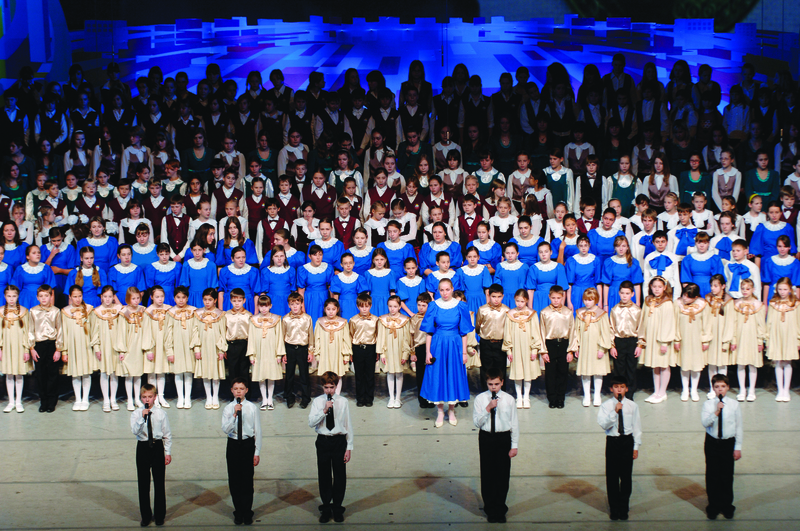 Usually more than 100 choirs (with more than 5000 singers) participate in the festival, in addition to a choir composed entirely of schoolchildren from Moscow; a truly unique choir, which brings together more than 3000 pupils from Moscow’s schools, which, during public singing festivals, perform compositions of the shared repertoire. In the autumn of 2010 the school Radost decided to hold one more musical show – an open competition for children’s and young people’s creative work, entitled ‘Musical Moscow Land’. This was an important step in fostering partnerships between children’s choirs from different departments – the Department of Education, the Department of Culture, local municipalities and other bodies. Some of the most important events included in children’s choir festivals are the meetings between their participants and some of Russia’s most famous composers of children’s music, such as Yevgeny Krylatov, Gregory Gladkov, Valery Kalistratov, Anatoly Kiselev and many others. In the autumn of 2012 Moscow’s Department of Education decided in favour of a complex educational program for youth called ‘Moscow Children Sing’, which combined the most important features of children’s choir art development, including the abovementioned creative shows. More than 60 concerts and competitive events were carried out by the program during the 2012-2013 school year; it not only confirmed the great social value of and the need for this aspect of children’s creative work, but received high praise in the professional environment too, visibly influencing the overall cultural life of both the city of Moscow and Russia as a whole. In such a way, today we have reason to hope that the government and social institutions of Russia will try to create conditions which generate support for youth choirs and the development of cooperation throughout the network, including on an international level. Our colleagues, the choirmasters themselves, the ones who work with children’s choirs, put in a lot of effort to make these wonderful projects part of Russia’s reality.